California redwood, like Western Red Cedar, is resistant to decay, rot and insects. The rich luxury of redwood furniture will add value to any home, cabin or patio. Redwood, which has a natural resistance to shrinking, warping and checking, is distinctively elegant with warm red tones. It's easy to stain, or it can be aged naturally, turning to a driftwood-gray color. The redwood we use is 1 3/8" thick, so a Standard Redwood Adirondack Chair weighs about 40 pounds -- heavier than cedar, but lighter than polywood. 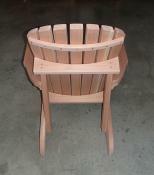 Standard Redwood Adirondack Chair (20-inch wide seat), unstained: $235. 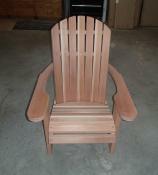 Big Boy Redwood Adirondack Chair (23-inch wide seat), unstained: $255. You can have your name -- or your significant other's name or your business name -- professionally carved into your chairs. Check out the details. Our cup or wine glass holders can go on either or both arms. They're only $5 each. These pillows are held in place with Velcro: $25 each. Stay tuned. We'll be adding chairs, tables and loveseats to the Redwood Collection. But if you have a special request, don't hesitate to contact us now. The redwood chair weighs about 40 pounds.